Dublin is not only the capital of Ireland but a world capital which has a unique charm all of its own. Situated on the River Liffey, it’s home to approximately 1.3 million inhabitants and is the heartbeat of Ireland. Nearly half the population of Ireland live in or around Dublin. One reason for people moving here is they have all the access to the wonderful Irish way of life whilst also having access to all the amenities of a bustling, modern city. When you’re moving to Dublin, it’s important to hire the right removal company. Once this is done, communicate with them and always keep them informed of your plans and more importantly any change of plans you have. The right removal company should also be able to supply you with all your packing and packaging materials. Make a list of what you need by going round your house and writing out a rough estimate. Ask your removal company about things like wardrobe boxes (boxes which you can hang your clothes in), as well as sofa and mattress covers. One thing you can do to help your removal company as well as yourself is to reserve a parking space for your removal van. This is done through the local council in Dublin. It may also be worthwhile notifying your new neighbours what day you’re moving. This is good in terms of ensuring access to your house as well as acting as a goodwill gesture. It will also be very helpful to prepare your house for the removal personnel. For instance, try to make sure they have easy access to what they have to move. Give easy access to items by making sure there’s a clear path they can follow. They don’t want to be clambering over anything and everything which can result in breakages. If you’re leaving items in the house, it’s important to mark out what you’re taking and what you’re leaving behind. One way to do this is by colour coding. Put a blue sticker on everything to be moved or if easier put a blue sticker on everything that’s to be left. You can also buy pre-printed stickers which say things like ‘For removal’. In addition, you can use colour coding for your new Dublin home so that the removal personnel know what goes where. It may seem obvious that the fridge goes in the kitchen but what goes in the hallway, bedroom or sitting room may be less obvious. Crates should be marked with the appropriate label as well as labelling all items ‘Fragile’ which are in any danger of being broken. This covers your own back as well in terms of insurance which you should take out for your move. Your removal company can also help you with your packing and unpacking or you can do it yourself. 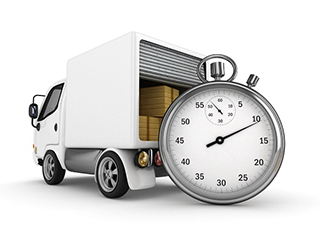 When you’re moving quite a long distance from London to Ireland it’s often best to hire this professional service. Your removal company should know which is the best route to take for your move to Dublin. However, if you have any ‘inside knowledge’ for them regarding Dublin or routes on the way this will be greatly appreciated and can again result in a much smoother journey. The secret to a smooth removal overall is to work with your removal company. See yourselves as a team and never hesitate to give them any information you feel would be helpful for your move. That way, your move from London to Dublin will be less stressful and more trouble-free.